Since I've been sick all of March, I haven't been too interested in food other than comfort food like the chicken noodle soup and lasagna that we made. 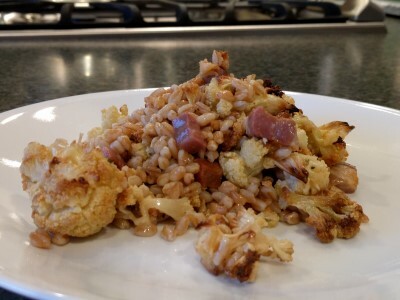 This week, we tried a new-to-us dish: Farro Salad with Cauliflower & Prosciutto. 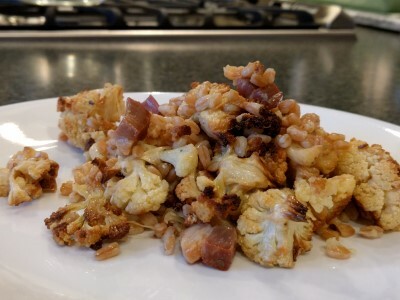 I really liked the Farro with Mushrooms & Pancetta that we made so we decided to try another farro dish. It's an easy dish to make. The first step is to cook the farro in water with carrots, celery, onion, and a bay leaf. Spread the farro out to cool and discard the vegetables & bay leaf. Roast the cauliflower. Cut the prosciutto into small cubes. We quickly sauteed our prosciutto to crisp it a bit. Make the dressing and mix it all together. This was good, but would have been better with fresh marjoram and parsley and perhaps some lemon zest. I think SP forgot to mix in the dried marjoram & parsley. We opted to roast the cauliflower instead of frying it. It seemed easier and less messy. We also crisped our prosciutto a bit. I think I might prefer thin slices of prosciutto sliced into small bits instead of these tiny cube chunks. This was a tasty and quick dinner. It was 4 servings for us, so 2 dinners.